Among the sights, sounds and smells at the Thursday Market in the South Perry District, Mama Torres' salsa booth stands out. A long table hosts a simple setup. The crowd around the table is constant and market-goers wait patiently on line for their turn to sample Gilda and Fred Meyer's original, spicy original, lechuga and pico de gallo salsas and flour tortilla chips. In a market rich with diverse choices of authentic, locally made salsas, Mama Torres' is unique, and that's a good thing. Mama Torres' salsa recipes have been passed down from generation to generation, reflecting the tastes and traditions typical of Gilda's family, who originats from the city of León, in Guanajuato, Mexico. "My mother's mother died when my mother was 7. My grandfather taught my mother to cook. These are my mom's recipes. I was the oldest of eight. I had to cook, so I just did her recipes," says Gilda. "Your enchiladas taste just like your mom's!" interjects Fred. "I've been making salsa for six years at farmers markets, but making it my whole life," says Gilda. "We are honoring her mom by naming the company after her. Since she learned from her mom who learned from her dad in Mexico, it was the best way to honor her," says Fred. Making salsa may be second nature for Gilda, but many other careers came first. 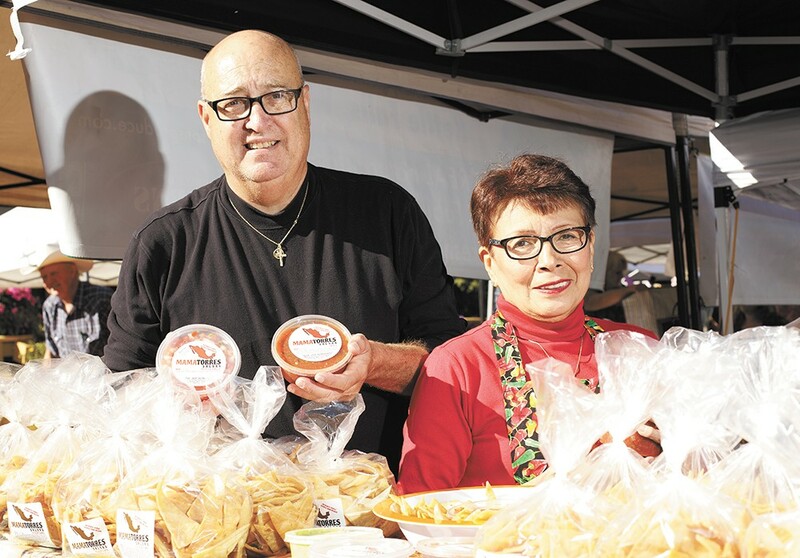 Mama Torres Salsa co-owners Fred, left, and Gilda Meyer. "I've done a little of everything. I was in retail, I did fingernails, and we opened [a grocery] El Mercado de Puebla. With two of us, it was too hard. One good thing is we didn't give the salsa recipes away," she says. After Fred retired, they decided to make salsas to sell at farmers markets and make that their main gig. They also take their wares to Green Bluff this month. Gilda's mother taught her to prepare the puréed salsas traditionally, by parboiling the tomatoes and then squishing and smashing them in a molcajete. Now she uses a blender to speed the process. Her original signature and spicy salsas highlight jalapeño and Serrano peppers in a crushed Roma tomato purée. Hints of onions and cilantro are balanced with a slight sweetness and Gilda's secret ingredients. For the lechuga salsa, fresh lettuce is blended with cilantro and a hint of jalapeño. Mama Torres' pico de gallo is transcendent. Precisely diced onions, cilantro, tomatoes and jalapeño are enhanced by the addition of extra lime. It's easy to imagine eating the pico de gallo with everything, and Gilda's eyes light up excitedly when she talks about pairing her salsas with food. "I do Mama Torres' original on an omelette, burrito or piece of meat. Also on fried potatoes or baked potatoes instead of butter. Pico de gallo goes great with carne asada and lechuga is delicious with wraps," says Gilda. Perhaps the simplest way to enjoy Mama Torres' salsas is with Gilda and Fred's flour tortilla chips. 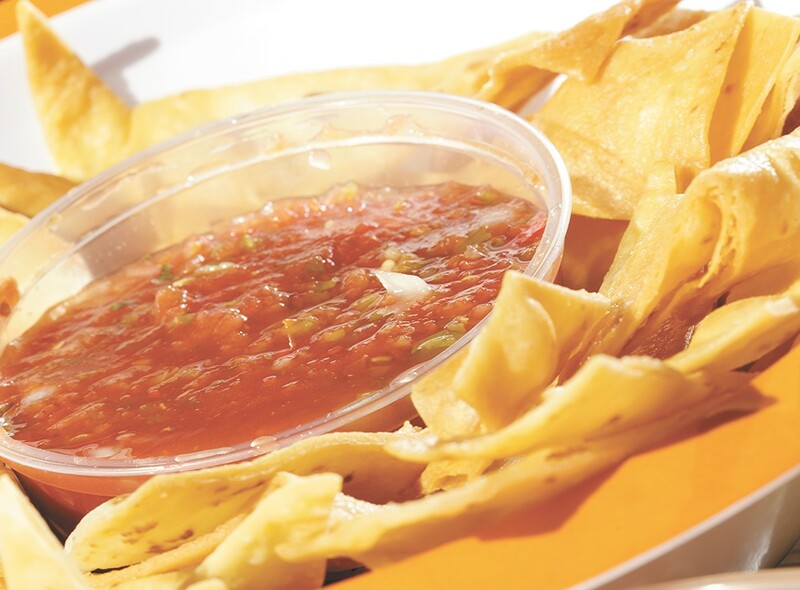 Hand cut and fried, the chips are perfect vehicles for each salsa. "You can go to the grocery store and there is a whole row of corn chips. Our chips are fried in corn oil and topped with nothing! Not even salted. You can throw cinnamon and sugar on them for a dessert. We sell out of our chips right away," laughs Gilda. Taco Chic Salsa: Since 1993, Rathdrum, Idaho's favorite salsa company has been elevating the salsa scene with jars of tangy, chunky and rich salsa in mild, medium or hot. Saddlin' Up! Nacho Salsa: A traditional puréed salsa, Saddlin' Up! is heavy on red chilies and garlic, ideal for dipping chips as well as pouring over tacos, enchiladas and quesadillas. Salsa Mendéz: The original and restaurant style salsas produced in the Spokane Valley may be light texturally, but both are dense with flavors of lime and cilantro. De Leon Foods: The homemade salsa bar at De Leon Foods features rotating favorites such as salsa habanero, pico de gallo, guacamole and salsa de arbol.